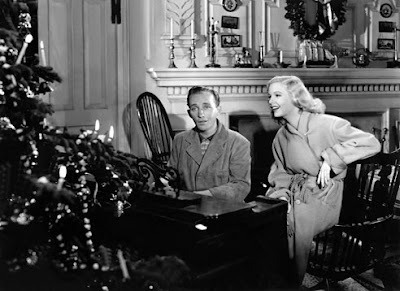 The picture that gave the world Irving Berlin's 'White Christmas', this musical caper starring Bing Crosby and Fred Astaire is actually a far more erratic and frankly odd affair than you may remember. Crooner Jim Hardy (Crosby) is heart broken when his fiancée Lila Dixon (Virginia Dale) ditches him for their co-star Ted Hanover (Astaire), preferring to carry on with her career rather than retire with Hardy to the isolated Connecticut farm he's just acquired. Hardy himself quickly becomes overwhelmed by the workload at his new ranch and decides to reinvent the venue as a nightclub, open only 15 times a year on public holidays. Meanwhile, Hanover is in turn dumped by Lila and follows Hardy to the Holiday Inn, where he encounters the latter's new protégé Linda Mason (Marjorie Reynolds) and duly falls for her too, much to Jim's horror. The pair bicker over Linda, the competition escalating from Valentine's Day to Easter to Independence Day, before matters come to a head when Hanover finds himself in a position to advance Linda's career in Hollywood. The Berlin songs are solid - from the aforementioned signature theme to 'You're Easy To Dance With' - the staging is charming and the leads are on fine form. I particularly enjoyed Crosby's bebop patois approach to slang: "Take a slug from the mug", he advises a hungover Astaire, brandishing a coffee pot. Walter Abel also makes an impression as the duo's cheerily manic manager Danny Reed. However, there's something weird going on with Holiday Inn. Firstly, there's the ill-judged blackface number for Lincoln's Birthday, which is often scrapped from modern television broadcasts of the film despite its necessity to the plot - the greasepaint providing a ruse to disguise Linda and thus keep her out of Ted's clutches. Like any minstrel bit in old musicals, the scene is patronising and irredeemably ugly to modern eyes but would have been recognised as a common vaudeville trope at the time. Equally jarring is the July 4th fireworks party in which Crosby, dressed as Uncle Sam, introduces a montage of stock footage illustrating US military-industrial might. This may have been made in wartime, but the decision to include such brazen patriotic tub-thumping is surely at odds with the otherwise dreamy, escapist tone of the piece. Perhaps the biggest problem with Mark Sandrich's film though is that it casts Astaire in a rather unflattering, predatory light, his Ted Hanover a disloyal and self-interested wolf who routinely trashes the romantic life of his best friend and business partner without a thought for the latter's welfare. 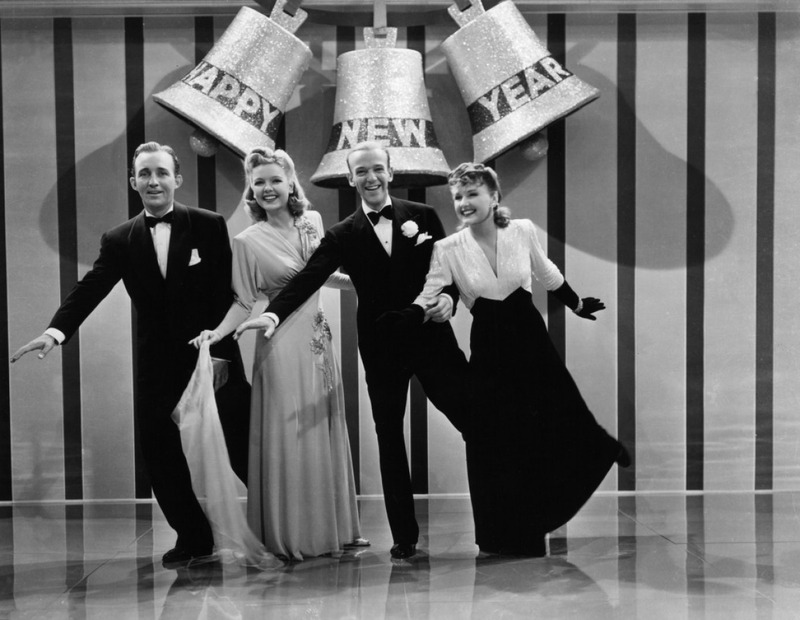 A New Year's Eve duet with Mason in which Astaire dances blind drunk to the delight of his fellow revellers falls flat, unsettling and unfunny because it's depression that's driven him to this boozy stupor. The dynamic Astaire's character establishes in turn forces Crosby to play the melancholy loser, a creative sadly noodling away at his piano while his showbiz pals and rivals make off with the spoils. Not a good look for the less naturally starry of the leads. For all that, Holiday Inn creates a toasty wintry mood and is an altogether pithier and breezier enterprise than White Christmas (1954), Michael Curtiz's Technicolor remake again starring Crosby, this time joined by Danny Kaye, which is probably the more often revived. That Holiday Inn's most enduring legacy should be giving its name to an international franchise of affordable hotels is an appropriately peculiar coda for this all-year-round Christmas comedy. Before Barbara Stanwyck and Fred MacMurray became embroiled in murderous insurance fraud, they were paired together in this pleasing seasonal screwball scripted by Preston Sturges. Stanwyck plays Lee Leander, a shoplifter arrested in the run-up to Christmas for filching a $5,000 bangle. MacMurray is John Sargent, the prosecutor at her trial who realises that juries are prone to be more forgiving than usual around the holidays so connives to get her case postponed until the new year. Feeling guilty about his actions condemning Lee to Christmas in jail, Sargent secures her bail and befriends the girl, learning that she too hails from Indiana and offering to drive her home to restore relations with her estranged mother. When this venture proves a disaster, Sargent invites her to spend the season with his own family where, naturally enough, they fall in love. But what to do about her legal battle? 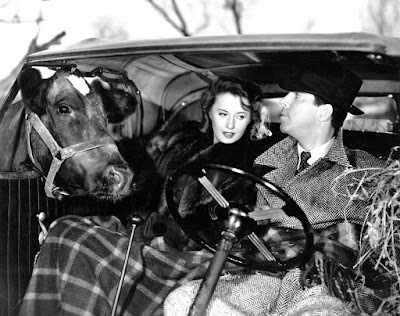 Sturges' script - his last to be directed by someone else, Mitchell Leisen in this case - follows the screwball comedy playbook to the letter, sending a mismatched pair out on the road as in It Happened One Night (1934) and revolving around a very Capraesque romantic thawing, as Stanwyck's tough gal learns to put aside her well-worn cynicism and believe in the simple homespun decency of her foil. The Indiana Christmas scenes around the Sargent hearth are especially heart-warming, however, and nicely contrasted with the grim Gothic melodrama of Lee's unhappy return to the cruel matriarch she deserted years before. There's also some lovely interplay between Beulah Bondi and Elizabeth Patterson as Sargent's gently sparring mother and maiden aunt respectively, the pair bickering over burnt biscuits and quietly conspiring to bring the young lovers together. There's something oddly moving about these women awaiting the return of their adored golden boy, the absence of Sargent's late father never mentioned but still clearly felt around the dinner table. Other nice character business comes from Willard Robinson as Lee's attorney, a frustrated thespian quite spellbound by his own rhetorical brilliance, and from John Wray as a mean Midwestern dairy farmer who takes exception to the travellers parking in his cow pasture and embarks on a citizen's arrest. Not all country folk are sweet, it seems: some are every bit as venal, resentful and vindictive as New Yorkers, a fine lesson from the inimitable and deeply wise Sturges. His own pithy summary of the film? "Love reformed her and corrupted him." This unjustly forgotten British Christmas picture from Alexander Korda's London Films proves to be astonishingly fresh 63 years on - thematically speaking, at least - and well worth a revisit. 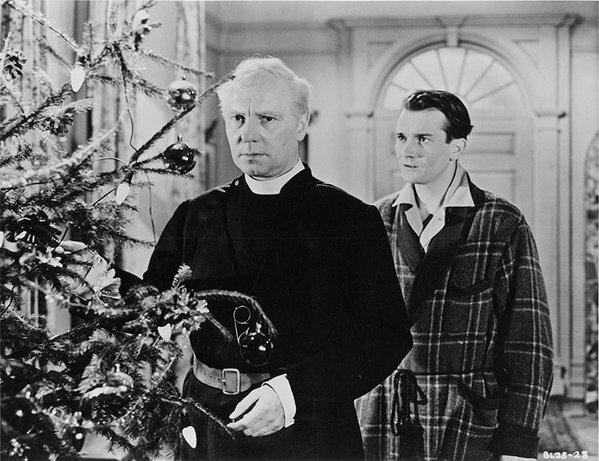 Directed by George More O'Ferrall from a hit West End play by Wynyard Browne, the film tells of Norfolk parson Martin Gregory (the great Sir Ralph Richardson), whose brood of disgruntled children return home for the festive season. Alcoholic fashion journalist Margaret (Margaret Deighton) and wayward soldier Michael (Denholm Elliott) privately resent their father's neglect in favour of his parishioners and the years they've spent shielding him from the complications of their adult lives. 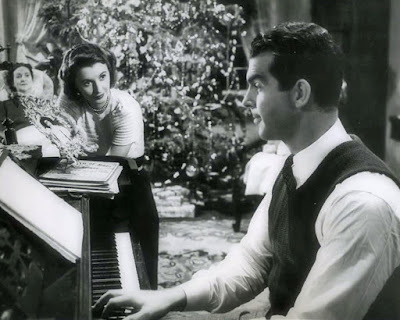 They also blame the widower for failing to look after himself, requiring their self-sacrificing old maid of a sister Jenny (Celia Johnson) to stay on at the vicarage as his unofficial housekeeper at the expense of her own happiness. The siblings, however, underestimate the old man's capacity to understand their respective angsts, the latter proving to be a great deal more worldly than the hapless, irrelevant, bookish caricature they treat him as. Hardly like to win favour with a generation who insist on Die Hard (1988) as their go-to Christmas classic, The Holly & The Ivy may be genteel and fustily old fashioned but nevertheless has much to say about veiled resentment and its corrosive impact on grown families that should chime with audiences today. Adapted by Russian writer Anatole de Grunewald to bring a Chekovian psychological rigour to Browne's original, there's a proto-Kitchen Sink grit about Margaret's backstory concerning the death of a child born (shockingly for the period) out of wedlock, the reason for her morose drinking bouts. The success of this bold and unflinching scenario is due to the considerable emotional pull of Margaret Deighton's tough performance, down but not out. As with the recently revived Brief Encounter (1945), the fate of Celia Johnson hangs in the balance and again we fall for it thanks to the actress's understated loveliness. It's Richardson though who really sells the thing, giving a typically affecting performance of enormous charm and subtly. His misunderstood man of god railing against the vulgar commercialisation of Yuletide and expression of profound doubts over whether or not he's valued by his community or has succeeded at all in making a meaningful contribution to their lives ensure that The Holly & The Ivy remains prescient and interesting, even if the world it seeks to depict has largely vanished. Sure, O'Ferrall's film is a more than a little creaky and stagebound in its execution and the snowy rural England it depicts the preserve of cards and chocolate box lids only, but it's a lovely bit of work all the same. I'd put it right up there with It's A Wonderful Life (1946), The Bishop's Wife (1947) and Scrooge (1951) among seasonal comforts.